Scientists have recently learned that amphipods, small crustaceans popularly called scuds or sideswimmers, will do whatever it takes to avoid becoming a predator’s meal—even abducting another species for use as their own personal defense weapons. Several amphipods have been found toting around tiny sea snails, called pteropods, like backpacks, apparently because predators don’t find the sea snails very tasty. Amphipods range in size from one millimeter to one foot, though most are less than half an inch long. They look a little like a cross between a shrimp and a flea, and most are scavengers that are the prey of birds and fish. Pteropods are less than a quarter inch long and emit unpleasant chemicals to deter predators. Amphipods have no such secret weapon, so they exploit pteropods by carrying them around. As a result, cod icefish pass them by for meals. But this isn’t a symbiotic relationship where the pteropod benefits from palling around with an amphipod. 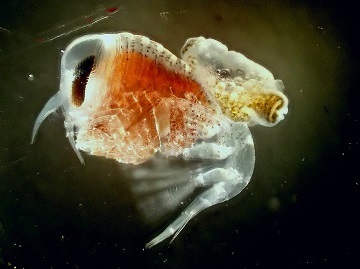 In fact, the pteropod likely starves to death while the amphipod holds it hostage, preventing the pteropod from hunting. Scientists have identified two different amphipod– pteropod species pairings, but they don’t yet know if these are typical pairings or how many amphipod or pteropod species end up in these arrangements. They also don’t know if predators other than cod icefish avoid the pteropod-carrying amphipods—or whether an amphipod would accept a ransom to release a pteropod.